Located at an altitude of 3,100 meters above sea level, Gangotri is a popular pilgrim Hindu town. Being the place of River Gangas origin, Gangotri is one of the holiest sites in India. Arena of this place grip people in the religious saga of Ganga Maa. At Gangotri Dham, idol of Goddess Ganga which is enshrined in the Gangotri mandir is worshipped by pilgrims. 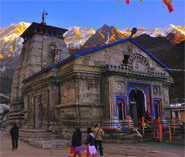 This 18th century white granite temple stands on the right bank of Bhagirathi at a height of 3042 mts. 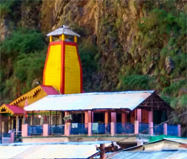 Tucked away in the Garhwal Himalayas, it a prominent part of Chota Char Dham Yatra in Uttarakhand. On pilgrimage to Gangotri, devotees rejoice pious aura of River Ganga amid the scenic natural surroundings. 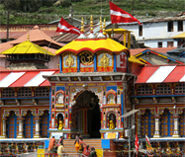 Gangotri temple opens on Akshaya Tritya day in April/ May every year. Temple closes after Diwali in November for the winter period. For six months deity of the temple is shifted and worshipped at Mukhyamath temple in Mukhba Village. Start planning your trip today as Gangotri Dham opening and closing dates for the year 2019 has been announced. Various traditional and religious poojas are offered to Goodess Ganga at Gangotri temple. In the morning Mangal Aarti takes place behind closed doors. The celestial Mangal Aarti in the evening light up the holy environment. Ganga Devi Pooja is also one of the important pooja performed at the holy shrine. This pooja take place both in the main temple and at the Ganga Ghat. Enclosed by dense Deodar forests and holy Bhagirathi river, Harsil is a small hamlet that lie on the way to Gangotri. It is of the major tourist attractions in Gangotri which is also known as Jalmanga Shivling. The shivling remain submerged in Gangotri River during summer and is only visible during winters. Nachiketa Tal is a scenic lake which looms at an altitude of 2453 meters above sea level. It is situated at a distance of 131 km from Gangotri. River Ganga originates from second largest glacier of India, Gaumukh Glacier. Gomukh, the snout of Gaumukh glacier is located at a distance of 17 km from Gangotri. Route to Gaumukh is open for pilgrims and trekkers from May to October. Mountaineers and even non-mountaineers can take the Gangotri-Gaumukh trek which is a moderate trek. On the trek trail you can enjoy the panoramic views of nearby meadows & peaks and witness the incredible sight of river Ganga emerging. 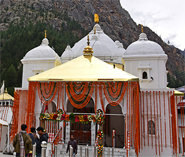 Gangotri one of the holiest shrines in Hindu religion is located in the Uttarkashi District of Uttarakhand. Gangotri Dham is settled at an altitude of 3048 mts in the Himalayas. Gangotri is well connected with major destinations of Uttarakhand by motorable road. You can board a state bus or private deluxe bus to reach the holy town. Taxi services are also easily available. Jolly Grant Airport, Dehradun is the closest airport to Gangotri. The airport is just 26 km away from Rishikesh. From here one can board a bus or hire a cab. Rishikesh railway station is the nearest railway station to Gangotri at a distance of 226 km. Many bus and taxi services are available from Rishikesh, Haridwar, Uttarkashi and many other destinations for Gangotri. Due to high altitude location, Gangotri faces many climatic changes. It is important to know the right Gangotri climate for a safe journey. The pleasing summer season it one of the best times to visit the Gangotri shrine. The holy shrine of Goddess Ganga remains closed in winters. Summer is the best season for pilgrimage to Gangotri. Summer season here starts in April and ends in May. Weather gets cool and moderate making it the perfect time for temple darshan and to explore the nearby destinations in Gangotri. In monsoon land slips are frequent. Monsoon season begins from late June and lasts till August. Erratic rainfall also takes place so one should be well prepared if they plan to visit Gangotri during this time of the season. Winters are freezing cold in Gangotri. Temperature also reaches sub-zero levels and the shrine remains closed for winter period. Winter season in Gangotri starts in November and ends in April.